Greenroofs can serve many purposes and provide many benefits. 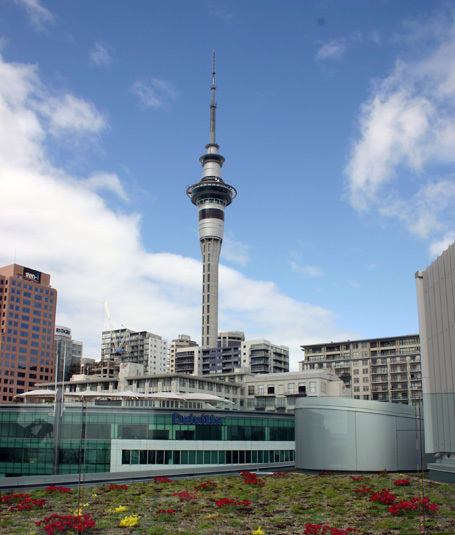 They look good – imagine a day when all the visitors to the Sky Tower can look down and see roofs covered with plants rather than black asphalt. – reducing the “urban heat island effect” which is caused when the heat from the sun is absorbed into buildings through the roof and then released back into the air causing the temperature in urban areas to increase to a level higher than normal. They help to insulate buildings keeping them cooler in the summer and warmer in the winter. They can help to extend the normal life of a roof and the waterproof membrane by protecting it from the elements. They can help to minimize the impact that a building has on the environment and landscape by helping it to merge into the area around it. Provide habitat for insects, bees and birds away from the streetscape and can often form predator free ‘islands in the sky’.